We Bring You the World! CALX Universal Gold Antifreeze is a 5-year, 150,000 mile extended life antifreeze and coolant for car and light truck engines. It provides protection from freezing, overheating, rust and corrosion and has an advanced complex of multi-functional inhibitors with dispersants to reduce scale and improve heat transfer and multi-metal corrosion inhibitors to protect all cooling system components and help costly engine failure. It is specially formulated to meet the requirements of US and European cooling systems, and many older Asian vehicles not requiring high phosphate, non-silicate formulas and is compatible with all premium quality cooling system products regardless of make, model or original antifreeze color including green, yellow, orange, fuchsia, blue or red. 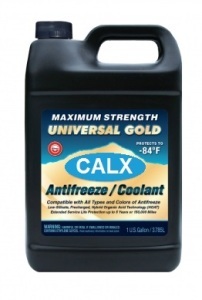 CALX Universal Gold Antifreeze is formulated both as a Ready-To-Use, 50-50 premixed and a Full Strength Concentrated Antifreeze, which can be diluted for individual freeze and boil-over protection. Maximum protection is based on a complete change of existing cooling system antifreeze. Always refer to your owner’s manual for cooling system capacity and recommendations.